I love my hut in Loglogo. The roof and sides of the hut are constructed by curved branches, lashed with jute and twine, and covered with the ever-present relief food bags and cardboard. Then the roof is finished on the outside with burlap bags and the inside is covered with large colorful cloths that are lightweight enough to let the breeze in. This morning my first job is to find my malaria pills – I was too tired last night to search for them. Before Kura leaves for Marsabit, we go over to the town to visit the new butchery group business, a business of four women and one man. They slaughter goats in a rotating schedule with the two other butcheries in town, receiving 500 to 600 shillings in profit per goat and paying 200 shillings per day for the rent of the building and the scales. The women also sell potatoes and diesel in the market. But when we arrive, only Ilo Kimogol, the sole man in the group, is working at the butchery, and as I want to visit with the women we agree that I will come back later in the day. On the way back, we pick up my best friend in Loglogo, Amina Rage. I first met Amina when we were working on our initial attempt at a beading project: she made beaded birds with beautiful detail. Amina made an impression on me because the only words she knows in English is “I fought the British!” Amina is 81 years old, hennas her hair, never asks me for a thing and brings me gifts – usually some boiled eggs and a small bag of salt. Last night she heard we were coming to town and so today she has baked me a cake. We bring Amina back to the camp and share the cake and some tea. I have always wanted to get the details of this fiery woman’s life and so we agree to meet later in the day so that her daughter can translate. In the meantime, Kura and Omar are off to Marsabit to make the repairs to Gumps, our vehicle. Our Business Mentor in Loglogo, Aleya, is also one of the women owners of Isgargaro. As we walk back to town with Amina, Aleya gives me a tour of the town businesses. Initially, Loglogo was our lesson in how not to run the program. Instead of the business groups of five people working cooperatively in one selling location, each member simply divided up the funds, bought products and sold them individually from their homes. Aleya is frustrated with these groups, as they do not seem very active and appear to be having limited success. In the meantime, Aleya and I make the round of the new businesses in town and on the outskirts. 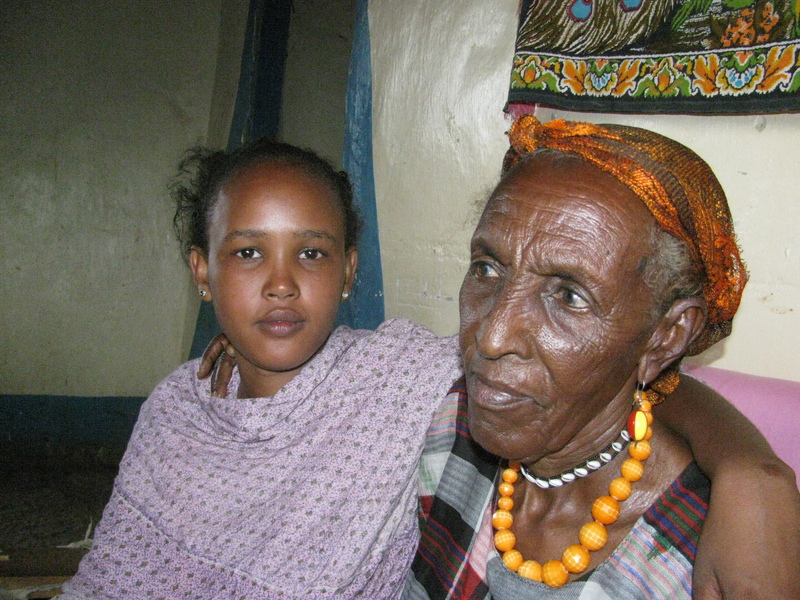 I spend an hour with Amina Rage and her two granddaughters. Naisibo has finished secondary school but Shankaron, her younger sister, has been sent home because she could not pay the school fees. Shankaron is impressive because unlike most young women in the region, she looks you in the eye and shakes your hand. Back at Isgargaro, we wait for Kura. Aleya sets me up with a plug into the solar-power system so that I can use my computer to enter notes and the data we have collected. 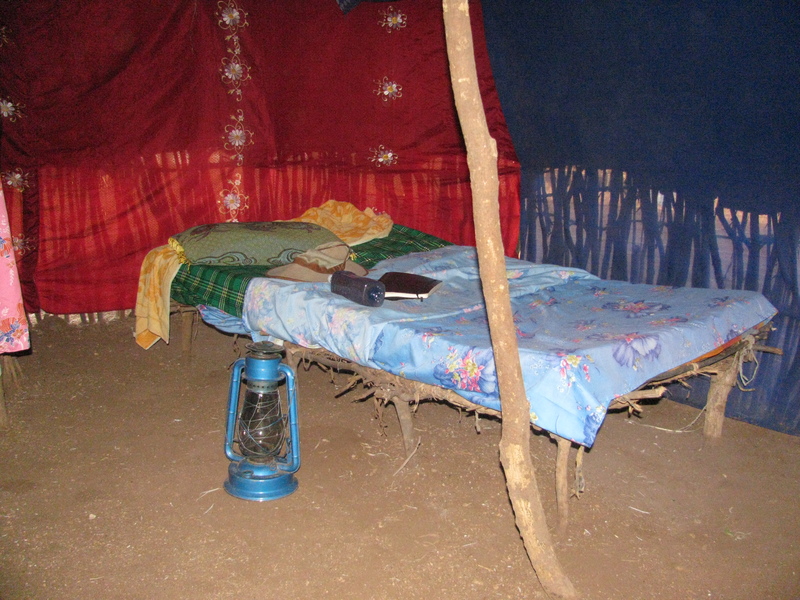 I sit comfortably at a desk in a room that is used at night for the shepherd’s classes that provide an elementary education for children who must be out herding during the day. Kura returns with the repaired Gumps, and we spend the rest of the night packing and preparing for our crossing of the Kaisut Desert tomorrow.